Dallas Ebola Kent Brantly blood transfusion: Survivor donates to Nina Pham. Kent Brantly at the press conference announcing his release from Emory Hospital after recovering from Ebola. 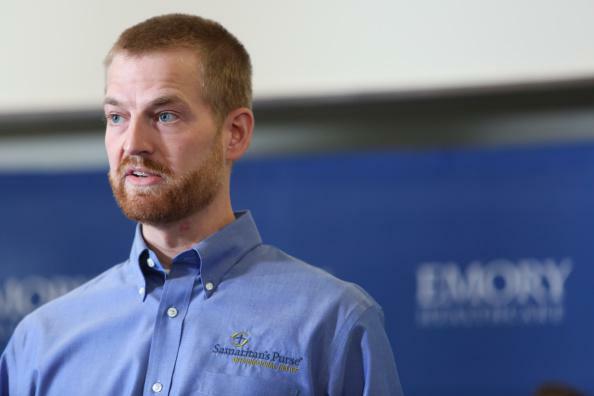 Jeremy Blume, a spokesman for the nonprofit medical mission group Samaritan’s Purse, confirmed that the plasma donation came from Dr Kent Brantly, the first American to return to the US from Liberia to be treated for Ebola. Brantly received an experimental treatment and fought off the virus, and has donated blood for transfusions for three others, including Pham. “He’s a doctor. That’s what he’s there to do. That’s his heart,” Blume said. Brantly said in a recent speech that he also offered his blood for Duncan, but that their blood types didn’t match. The Guardian piece adds some detail about Pham’s contact with Duncan, writing that she worked in his room “often, from the day he was placed in intensive care until the day before he died.” That’s a span of 10 days. Boer Deng wrote today in Slate about the preventive gear worn by Ebola workers and the removal process thereof.